7 years ago, an Explorer started to convert His dreams in actions, in order to describe it he chose a name: FoldingLife. 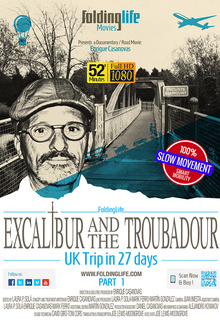 Today, PART 1 of the Documentary/Road Movie done on 2012 in the &quot; Tour of United Kingdom(UK) in 27 days in FoldingLife style&quot; it's a reality. One men search, observe through the movement and the different experiences that are happening, answers to carry a Slow and more Smart life. The humanity of the Characters / People, the Folding Bike and different transports that he is using, they will related to Excalibur and the Troubadour.